My husband and I are fans of your show and we watch it almost every night. I was getting ready to go to bed Friday night, when my husband called my attention to some of your talking points for your show that evening. One of the topics especially caught my attention and I stayed up to listen. This topic was in regards to the Witches of Brooklyn holding a “hexing” ritual for Supreme Court Justice Brett Kavanaugh. You see the topic interested me because I am a witch myself. I am also the founder of an online organization known as Witches of the Craft. We have a following of over 34 million people. Our organization makes up all Religions and Traditions. We have members that are Witches, Wiccans, Baptists, Christians and Catholics. 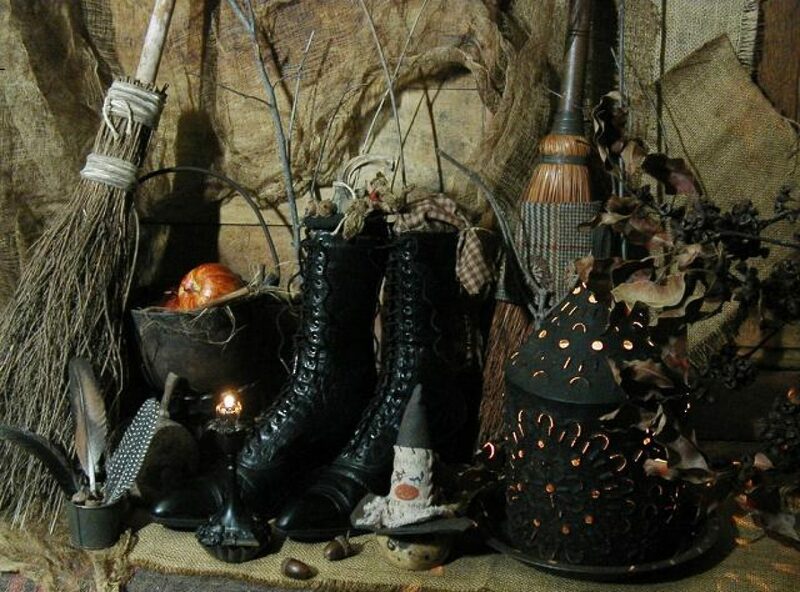 We welcome anyone who is a witch or even just interested in learning about our ways and our practices. When the WOTC (Witches of the Craft) was first formed it was our mission to spread the truth and beauty about our Religion, Witchcraft. I know some in our community would disagree with me that Witchcraft is a Religion but to me it is. Our other goal was to dispel all the old myths and stereotypes that have been associated with Witches and Witchcraft throughout the ages and also by Hollywood. Witches have always been portrayed in a negative light and that cannot be the furthest from the truth. We have been shown as being evil, dark, nasty, devil worshiping individuals. Which is by no means the truth. I know the public has always even feared the topic of Witchcraft and Witches. The emphasis that was placed on these witches doing this “hexing” ritual only set us back further in our cause and effort to let the public know what witches are really like. We are not evil, we are not dark nasty beings that prey on the innocent. And by no means are there any nice hexes to send to anyone. A hex is sent for the sole purpose of doing harm or causing harm to an individual. I know you said you were unfamiliar with the topic of Witchcraft. Witchcraft falls under the umbrella term of Paganism. Paganism has been shown to have been one of the oldest religions on this planet. Now you have to keep in mind what I am telling you is the beliefs I was brought up with, I am a Hereditary witch as well as being a gray witch. A Hereditary witch is a witch who comes from a long line of witches in her family. Our history is very sketchy because in the 1600’s, the Catholic Church was raising to power. At that time the Church was young and very money hunger. The Pope declared that anyone who did not convert over to the Catholic religion be determined a heathren or a witch and would be put to death. Not only did he do this, he also took all the money and property of the individuals that did not convert, then put them to death. In order for our religion to survive, it had to go underground. Anyone who was found with any of our teachings or writings was also put to death. So witchcraft is basically an oral tradition passed down from one generation to the next. What I know about Witchcraft was passed down to me from my mother and to her from her mother. This is the only way Witchcraft was to survive. If our ancestors had not took the chances they did, then we would have never even known Witchcraft once existed. Witchcraft has basic tenets that are believed in and followed by all witches. We have laws, Redes and a Code of Chivalry. We are taught to honor the old Gods and follow the teachings of the ways of the Ancients. One of our main tenets is “do as ye will, if it harms none.” Most people do not know enough about the Craft to know this tenet even exists, nor do they want to take the time to learn that it exists. Also in the teachings of Witchcraft, you have to study for a year and a day before you can dedicate yourself to The Craft. The extra day is to give the individual time to decide that they are ready to commit to the The Craft. Most people don’t know that we believe in a higher power than ourselves. Most people believe The Craft is a Godless religion and it is not. Personally, I believe in the Divine Feminine known as the Goddess. We have a female head (which is primary) but we also have a male figure head as well. The women who are witches tend to lean more toward learning the ways of the Goddess, while the men lean toward the God. We study the Goddesses and the Gods, we abide by their teachings and we are a very strong believers in Karma. Also another tenet, “what you send out, comes back to you three-fold.” In other words, if you send out good then good will be returned to you three times over. If you send out evil, evil will return to you three folds overs. It is true we cast spells, make potions and do our rituals. But our rituals and as I have always taught my followers, are to be for the betterment of mankind and the protection of our Mother Earth. That is the reason we were given our powers, for the betterment of mankind and to protect Mother Earth and all of the creatures the Goddess has given us. Our intent is never to cause harm or wish evil upon anyone. The intent of the Witches of Brooklyn is not standard practice for most witches at all. Personally they baffle me, one of the other laws handed down to us that I did not mention was the Ordains. There are three sets of Ordains. In these Ordains, are guidelines on how a witch is suppose to live among the mundane, among her community and on how she conducts herself. In the Ordains it is stated that a witch should never identify herself or any other witches openly. I have had some come out and ridicule myself for speaking and teaching the Craft. But if someone don’t then the truth about Witches and Witchcraft will never be known. But back to the Witches of Brooklyn and their ritual. It makes me wonder if the left has totally come unhinged. They have tried every scare tactic that they can think of to tear down President Trump and everything he has done good for our country. Now they have nothing left but to bring Witchcraft into their fold. Witchcraft being one of the oldest and most feared and misunderstood religions to the fore front once again. To use The Craft as a scare tactic, to make it seem evil and harmful to others. I believe they have. I also believe by their actions they have sent Witchcraft back into the Dark Ages destroying the progress we have made in educating those who wish to know about our Religion. I know you kept referring to WItchcraft as Dark magick. Dark magick does exist but the witches of the past and the witches of the present do not practice it. The only time a witch would cast a hex or a curse is if one of her loved ones were being unfairly attacked. We would not willingly cast a hex or curse against an innocent being. Again, let me emphasis there is no rainbow colored or nice hexes or curses. They are part of our heritage and our religion but we teach about hexes and curses so that others will know how to defend against such malicious attacks. I know I had thrown a lot of information at you but I would like for you to see that Witchcraft is not evil nor dark. These witches in Brooklyn are not a true representation of the Witchcraft community. There is a lot more to Witchcraft than I could ever explain to you in an short email. I could write you a book and perhaps then not cover Witchcraft totally. But I would like the record to stand that not all witches are evil and nasty, quite to the contrary. We could be your next door neighbor, your brother, your sister or a close friend and you would never know it. We are just like you and we want to co-exist and live in peace. Most of all we want our Religion to be understood not afraid of. We do not condone the actions of the Witches of Brooklyn and I believe you will receive more emails just like this one saying just that. Or at least I hope you do. If you would like to know more about the subject of Witchcraft, you can check out our site or I would suggest searching for it on the internet but some of those sites are not very reputable. I will give you the address to our site below, if you are interested in learning more about Witches, their practices, their beliefs and most of all their Religion. I sincerely hope you will sit down sometime today and take the opportunity to drop him a line. May the Goddess Bless You & Yours With A Very Beautiful & Relaxing Saturday Morning! As for me, it is work as usual…..
Good morning, my dear brothers & sisters of the Craft! I hope everyone is having a great Saturday so far. It is a working day for me as usual. I gave everyone else the day off and I am going to revamp our store. I haven’t never been totally satisfied with the way it looks and I know I can do better. I am going to tear her down and build her back up today, I hope! I did want to call your attention to one thing though. Around here in the evenings, we watch FOX News. I know some of you have called FOX News purely entertainment news. But we each have our own opinions and you know what people say about opinions. After a very long day I was getting ready to go to bed. One of the boys were catching up on the News and ran across the Tucker Carlson show that had aired earlier that evening. He caught some of the talking points on the show last night and he hollered and told me to come here. He said that one of the talking points was going to be about a group of Witches in Brooklyn holding a hex-in. Yes, you heard me right, a hex-in. The hex-in is suppose to be directed at the new Supreme Court Justice Brett Kavanaugh, rapists and those who commit violence against women. Now don’t get me wrong, I do not condone violence against women or rapists either one, especially since I am a woman. I think the part that got me was thai they were actually going to cast a hex on Kavanaugh. I will be truthful with you (and you know I don’t like to get involved in Politics) but I honestly believe Brett Kavanaugh got a very raw deal. The media and everyone came down on him and automatically found him guilty. The last time I checked you are suppose to be presumed innocent until proven guilty, but not in his case. No credible evidence could be found that supported any of the clains that were brought against him. Plus, the FBI did another background check on him (for a total of 7) and still turned up nothing. But yet, in the minds of many Americans, he was still guilty. I don’t believe that at all. I do believe it was the Democrats trying to stall or get him to put out of his nomination for the Supreme Court. Thankfully, he had the fortitude to stay strong and not give into the pressure the Democrats were throwing at him. If he has withdrew his nomination, what a horrible turn our justice system would have took. You would no longer be presumed innocent, you would be presumed guilty and then have to prove your innocence. That is not the way our forefathers established this country and Goddess forbid if it ever becomes that way. But this is just another one of those heated government battles that we have witnessed for the last two years. What will be the next? I am really afraid to even ask that question anymore. The Democrats have been upset ever since Trump won the Presidency. They have stopped at nothing to smear him and show him in the most unflattering light they can. You never hear of the good things he has done for this country so far. He has kept his campaign promises, we have new jobs like never before, unemployment is a all time down low and America is becoming respected once again on the world stage. I don’t know if you know it or not but before he took office, the world looked at the U.S., as a third world country. That is pitiful for the once greatest country on this planet to be reduced to being a third world country. I admit I had my doubts about what kind of President Trump would be but he has kept his campaign promises, which few do and he is starting to turn this country around. Enough with the country’s politics, back to the Witches in Brooklyn and their hex-in. I have a tendency to get upset when The Craft is portraited in a negative light, as we all should. We have worked very hard to get our message out there and let the truth be known about Witches and Witchcraft. On the show, Witchcraft was portraited as dark, evil and a hint or two at being Satanic. Needless to say, I didn’t go to bed, I ended up writing the show in regards to this matter. Mr. Carlson stated that he was unfamiliar with The Craft. So I wrote him a letter. In this letter, I explained some of our core beliefs and tenets. Whether it did any good or not, we will see. But for a bunch of Witches (which at morning’s first light, I am wondering if they are really witches) to come out and openly announce a hex-in. Then the show when on to ask the question, is their any good hexes? They painted hexes as being non-harmful and then wondered if this might really work. If they were true witches, it just might but again I have my doubts that they are. I explained to Mr. Carlson that there was no such thing as a nice hex. Hexes are malicious and sent to do harm to the individual it is intended for. I also told him that the organization I represent runs the other way everytime I bring up the topic of hexes or curses. I told him that yes there was hexes and curses in our community but a normal witch would not just cast one on a innocent person. She might cast one if a loved one or family member was being threatened or harmed, but never on an innocent person. I also went on and gave him some of our Laws, Codes of Ethics, The Witches Chivalry and the Ordains. I gave him quite a bit of information or as much as I could in an email. I got angry when I saw what these Witches were planning on doing, plain and simple. I know personally the WOTC has fought for years to dispel all the old myths and stereotypes against Witches and Witchcraft. To spread the truth and beauty about our religion, WItchcraft. Yes I can call it a religion, remember I am a Solitary witch also. But for these witches to come out and openly hold such an event has thrown us back into the middle ages. They are planning on holding the event on October 20 and are selling tickets to anyone who is interested in attending. I believe one of the Ordains specifically states that we are not to sell our talents for profit. But they stated that the profits from the sale of tickets would go to a non-profit organization. Perhaps that is a their way to get people to attend the event by telling them they will be sponsoring something good by coming. I think the idea of holding a hex-in is a new low for the Left. Whether you keep up with the News or not, I can guarantee you in the past few months the Left has got extremely bad. You have the ex-Attorney General Holder calling for people to kick the Right in the head. You remember the saying Michelle O’bama had, ” when they go low, we go high.” Not anymore, Holder is calling for “when they go low, we kick them in the head.” What kind of society are these people striving for. I believe the Left has run out of scare tactics and this “hex-in” is a last ditch effort on their part to scare normal Americans. Since Witchcraft is one of the oldest, misunderstood religions on this planet. They drag out Witchcraft as a last resort to scare people into their way of thinking. Personally, if one side or the other had a group of witches that were hexing people for no reason at all, I wouldn’t join it. The whole little segment on this hex-in turned my stomach and it should yours too. I am going to place a link to the show last night on here. The letter I wrote to Mr. Carlson will be in the next post because it is rather lengthy. After listening to the segment, if you feel the way I do, drop him a line and let him know. Let him know not all witches are so easily swayed by one political party or the other. We have Codes of Conduct we live by, we are not here to harm mankind but are to better it and protect our Mother Earth and all the Goddess’ beautiful creatures on our planet. Got a minute check it out today. Got another minute, drop him a line and let him know what real witches are really about. The subject line ought to inflame you enough to drop Mr. Carlson a note. “Witches pick,” no not all witches stand or tolerate such behavior. Drop him a line and let him know, the link for sending Mr. Carlson an email is below. I would encourage you to take a moment out of your day and drop him an email in regards to this subject. All Witches, No Not All Witches, just a select group of Left wing Liberals calling themselves witches, do not represent the whole Witchcraft community. Let your voices be heard.